Anthony Bourdain spent countless weeks on the road every year exploring different cultures and inviting viewers of his TV shows to join him on his culinary adventures around the world. However, the late author and celebrity chef, who died of suicide earlier this summer, credited Vietnam as the place that really changed his life. Now, one travel company is making it easy to explore the country Bourdain loved so much just as he did with a brand new 14-day tour that hits nine cities and retraces the globe-trotting chef's footsteps there. The itinerary for A Tribute to Anthony Bourdain: Taste of Vietnam was curated by the Vietnam-based tour company Exotic Voyages, and takes travelers on a 14-day, 13-night excursion around the Southeast Asian country visiting a number of the eateries featured in various episodes Bourdain filmed there, among many other activities. The tour is also led by Diep Nguyen, who worked with Bourdain on the 2016 Parts Unknown episode through North Vietnam. The tour is jam-packed and guaranteed to give you a great taste of the country's rich culture, kicking off in Ho Chi Minh City with a clay pot rice dinner at a Bourdain favorite, Com Nieu restaurant, which can be seen in episode 10 of No Reservations' fifth season. Then, after catching a show at the Opera House, it's off to the Ben Tre province, and a cruise along the Chet Say River. Some other highlights include a stop at the Japanese Thanh Toan Bridge, a visit to Hoi An's Central Market, and a scooter tour through Phung Hung Street in Hanoi. 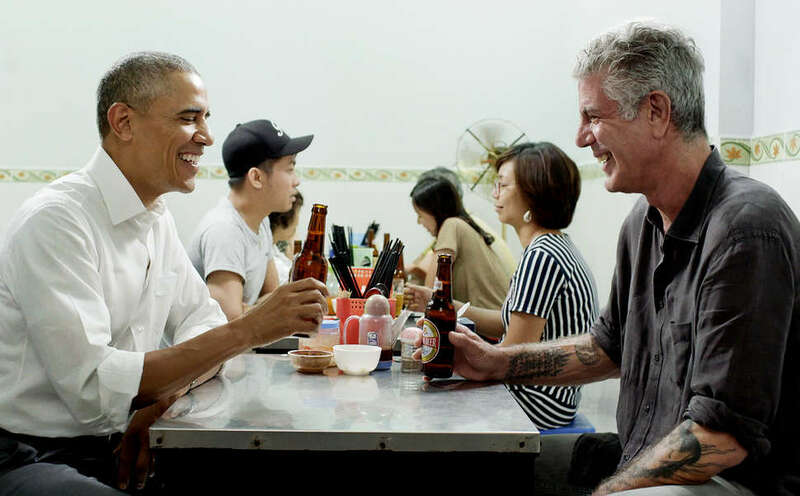 The Hanoi stop also includes a jaunt to the small restaurant where Bourdain famously dined with President Barack Obama (the chairs and table they sat at are now preserved in a glass case). As with any trip befitting of Bourdain, there will also be plenty of opportunities to enjoy Vietnam's many delicious street foods. The tour is all-inclusive, which means all meals, accommodations, and transportation are covered (except for airfare to and from Ho Chi Minh). That also means that it's pretty pricey, with rates starting at $3,755 per person. Still, for any Bourdain super-fan out there looking to see Vietnam like the man himself, you really can't do much better.